"I liked the feeling of being in a car and out on the open road," says Mars Bonfire. "And the opening line 'Get your motor runnin' / Head out on the highway' came to me from that driving experience." If there's any man qualified to compile the ultimate collection of road anthems, it's Bonfire, who wrote the most famous road anthem of them all, Born To Be Wild, for Steppenwolf. 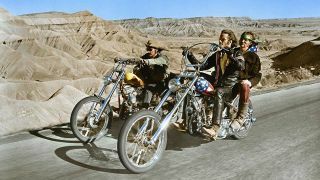 After climbing to #2 on the Billboard chart in the summer of 1968, the song ingrained itself into the counterculture after featuring in Dennis Hopper's classic road movie Easy Rider. And now, 50 years since the release of Born To Be Wild, Bonfire has helped compile Classic Road Trip, a triple CD, 60-track collection of road anthems for the 21st Century. Featuring all-time greats like Lynyrd Skynyrd's Freebird, Cream's Sunshine Of Your Love and Canned Heat's On The Road Again - as well as Born To Be Wild - it's out now. Below, Mars Bonfire picks the 10 records that changed his life. "It's not so much the song as the sound. With this record I knew something very different from the Big Band Swing my parents listened to had arrived! The sensuous, slightly distorted slightly whiney vocal by Elvis with the field holler whoop at the end was mesmerising, as was the reverb- and echo-drenched guitar of Scotty Moore and the slap bass of Bill Black. For three guys with no drummer they had a full and solidly rhythmic sound. I was irresistibly drawn to this new music, and although I didn't realise it at the time, my course in life had been set: I would create music." "The great Rockabilly vocal with hiccups and panting, the walking bass line propelling the track forward like a stealthy slinky cat, the sharp and blistering guitar solo, and the heavy effects on the snare drum accenting the second and fourth beats make this a standout recording. I listened to it over and over again until my Mother took my 45 single away. And the line: "She's the queen of all the teens" stirred feelings at a time when I was becoming aware of girls." "Much more than the great vocal with falsetto and the full arrangement with strings. This is a song that stands on its own, independent of interpretation! I knew nothing of music at the time, and yet it was obvious that in its complexity this was way way beyond the infectious three chord blues based Rockabilly music I loved. It was an aria fit for an opera that never arrived. This song was always a reference point in my writing, encouraging me to expand the melody and chord progression." "Again this is more about the song than the record. Chuck Berry was a great rock'n'roll singer, and a distinctive showman with his duck walk. And his driving guitar style - in which the fifth note of a chord moves to the sixth and continues back and forth - is instantly recognisable as the backbone of early rock'n'roll. He would be celebrated for any of these skills, yet his songwriting soared into a realm that few have entered. He could tell an engaging story that moved through time and place and do so in natural everyday language that never felt contrived or forced and then put it to a simple and happy melody that the world couldn't help but sing! Like Roy Orbison, he has always been a reference point." "This song was written by Bo Diddley and is built on his signature Bo Diddley beat. Its significance for me is that while my Dad had taken me to see an Elvis concert in Toronto, the screams were so loud and constant I couldn't hear the music. All I knew was that Elvis was wearing a gold suit and shaking around the stage until it was announced that Elvis had left the building. "Then my Dad took me to see Ronnie Hawkins and the Hawks at a nightclub in Toronto that had a Sunday matinee for kids like myself who were too young for the regular performances. I had just gotten my first electric guitar, and as soon as they launched into that song with Robbie Robertson using a pick between thumb and first finger and steel finger picks on the next two, playing a Telecaster run through an amp with distortion, I knew I had heard the guitar sound of my dreams! "I copied his style and guitar and had that sound in mind when I wrote Born To Be Wild. My apartment made demo didn't turn out that way though because I had been kicked out of my previous apartment for playing my guitar amplified and had already gotten complaints in my new apartment. So I did the songwriter demo of Born To Be Wild singing quietly and using an unamplified Telecaster." "If it weren't for the incredible good fortune I've had with Born To Be Wild I'd probably be back on the production line at General Motors of Canada in Oshawa Ontario. That was the only job I had been trained for, and I dropped out of college to chase my music dreams well before getting a degree. The success of Born To Be Wild has allowed me to pursue my lifelong interest in hiking, snowshoeing, weight lifting, and target practice." "First of all, this hit established that it was no longer necessary for a song to be in English to be successful! And it introduced to the rock audience percussion instruments - beyond the standard drum set - that occasionally threw in polyrhythmic fills. And the backbone accent pattern of the song, carried by the organ and bass, is outside the familiar rock pattern. This overwhelmingly fresh sound led me to the world of Salsa and Afro/Cuban Jazz and to such delicious recordings as Tito Puente doing Ran Kan Kan and Marc Anthony doing Aguanile. "This stunning creation brings together brilliantly trends that were developing in the New Wave '80s. Like Depeche Mode, Flock Of Seagulls, Echo And The Bunnymen, and other groups of The Second British Invasion, the vocal is done in the natural voice of the singer. Groups of The First British Invasion tended to sing in an American Blues style, Mick Jagger being a prime example. And this recording continues the ascendancy of the synthesiser/sampler over the guitar and the drum machine over a drummer. "The overall recording technique moves us into the current era where most instruments are synthetic and every parameter of the sound, including vocal pitch and timing, is controlled by a computerised mixing program." "Finally I got to be the age my parents were when I was growing up and listening to the music they loved in the background. I revisited The Kingdom Of Swing and The Great American Songbook and realised what a treasure of songs and musicianship it is! "As one of many examples I might have chosen there's Stardust, a perfectly crafted melody and a haunting romantic lyric. In the Nat King Cole version, which includes the introduction, we get to hear his incredibly resonant, rich, and mellow voice riding high above the track. There was no need to bury the voices of Nat King Cole, Tony Bennett, and Frank Sinatra or to put a lot of effects on them. They were instruments of perfection that could take centre stage. "In the Artie Shaw version, which omits the introduction, we are treated to the skills of the Big Band arranger and the virtuoso playing of the soloists culminating in the celebrated soaring clarinet by Artie Shaw. Such a complex auditory feast with a saxophone section interweaving with a horn section, along with multiple key changes, is only possible through skilful arranging way beyond the needs of an ad-lib rock group." "This is the aria from the final act of Puccini's Opera, Turandot. In this performance we reach the limits of sublime human creativity! No one will ever write a more beautiful and powerful melody and no one will ever sing with greater technical and emotional perfection. "It causes us to contemplate why music cannot remain static but must ever keep evolving. When one generation of creators and performers sets a reference so high those who come after will look inadequate, the only thing to do is go in a different direction to avoid comparison. Hence we have atonal music in the symphonic world to avoid looking like a lesser Puccini, Tchaikovsky, or Beethoven. "We have free jazz to avoid being judged against Johnny Hodges, the mesmerising saxophonist with Duke Ellington. If a singer realises they will never sing with more piercing intensity than Robert Plant or more soulfulness than Ray Charles then the only way forward is to forget about singing and talk the lyrics, which brings us up to the moment with Hip Hop/Rap." Classic Road Trip is out now.